The SSSCat system is designed to keep your cat away from a specific location. It does so by using a motion sensor that basically determines when a cat walks into a specific area and then it blows a jet of compressed air in that direction. 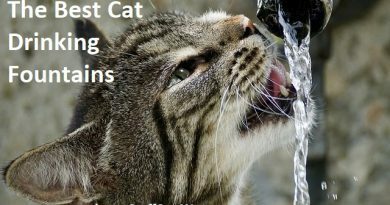 It is also a great idea in that it has a major difference compared to other default methods of deterring your cat like yelling “No!” (bad idea). Spraying your cat with water yourself (also a bad idea) or even shaking a jar of change when your cat goes somewhere you don’t want her to (again, bad idea). Both these methods often just make your cat afraid of you. What’s that key difference you might ask? Well since the SSSCat is an automated product and doesn’t require your interaction the cat doesn’t start to associate the spraying of air with YOU! This is imperative when training your cat to stop a certain behavior. Cats can very quickly start to associate all of those above items I mentioned with you. Then as opposed to linking the things they don’t like to their behavior they simply start to think you are scary. Not exactly the best way to form a loving relationship with your feline friend. The SSSCat helps you avoid this pesky problem by enabling your cat to redirect their unhappiness toward the SSSCat itself, big plus! I will freely admit that I have had mixed success with the SSSCat. What it really comes down to is the specific cat. Since I foster quite often I have a lot of cats that have totally different personalities coming through my house. Cats that aren’t super adventurous and are scared easily will definitely be impacted by the SSSCat and will likely stay away from areas that it has been placed in for days if not weeks at a time. My scaredy cat Lexi definitely did not like the SSSCat and steered clear of any area she encountered it in for quite a while. 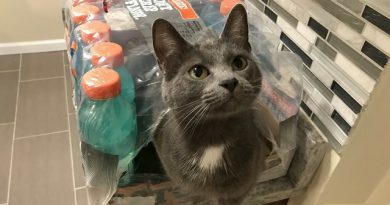 [Update as of 6/27/18] – I had a new foster cat this past month that was an absolute counter surfer. She was a 2 year old female that had been a stray for quite some time before. She simply would not stay off the counter with double sided tape, aluminum foil, etc. You name it. I pulled out the SSSCat after probably over a year of sitting in a drawer (my cats no longer climb on the counters) and put it to work. Within about 3-4 days and 10-12 sprays my foster cat now stays off of the counters 95% of the time. This was a cat that would let herself get absolutely covered in double sided tape and just shake it off no problem. The SSSCat got her in line within a couple of days and she’s far more bearable in the house now! On the other hand I’ve had super adventurous young male cats a few times as fosters. They are not very afraid of the SSSCat after the first or second time it sprays them. Not only do they start ignoring it, but I’ve even had them knock it over pretty easily if they happen to hop up on the counter from behind it. All in all I’d say it is a great gadget if other options haven’t worked. I’ve referenced this product in multiple places (like how to keep cats off your counters) because of the success I’ve had with it and the documented success others have had with it. The biggest drawback of the SSSCat is that it is expensive to refill if you pay for the name brand refills. You can check this awesome video out for a way to keep refilling the original can with nothing but a bike pump and a tire valve. You’ll likely already have the bike pump, but you might need to buy the tire valves. The SSSCat is quite easy to setup and flip on within minutes. The directions are easy and it is pretty hard to screw up the setup. The SSSCat works great when you’re not around to keep an eye on your cats and serve as a deterrent. The SSSCat is super lightweight and really easy to relocate. This is helpful because if you have smart cats they’ll simply stop going to the one spot they get sprayed. The SSSCat ensures you can maintain a positive relationship with your cat because your cat will be unhappy or afraid of the SSSCat or the places it was setup as opposed to being afraid of you. The base product and initial can of compressed air come in at a relatively affordable price range to get started on training your cat. The area of coverage from the SSSCat sensor is relatively limited. This means you’ll have to get multiples or rotate it on a schedule (which is easy as noted above). I’d recommend rotating yours unless you have a lot of issues and need multiples. The refills of compressed air really add up quickly if you have cats that like climbing on counters or high places. Be sure to check out this video (same as above) for more info on how to do this super cheap. The SSSCat is great at scaring the heck out of you, especially if you forget you left it on. I’ve startled myself at least a dozen times after forgetting about it. The base of the system is a simple can of compressed air which means it gets knocked over incredibly easily if a cat gets near it. Once it falls over it isn’t very effective until you set it back up again. It can and will startle your cat and in their fright I’ve had them jump off high places or knock things over in their sprints away from the SSSCat. While generally not a huge problem, be sure not to put anything breakable (glasses, vases, etc.) nearby the SSSCat while it is operating. What type of batteries does it take? It requires 4 AA batteries that are not included. Does it have an on / off switch, or is it ‘always on’ once you add batteries? It does have an on / off switch and is easy to flip on and off. How long will a single can of air last? This is difficult to determine because it totally depends how often your cats set it off. 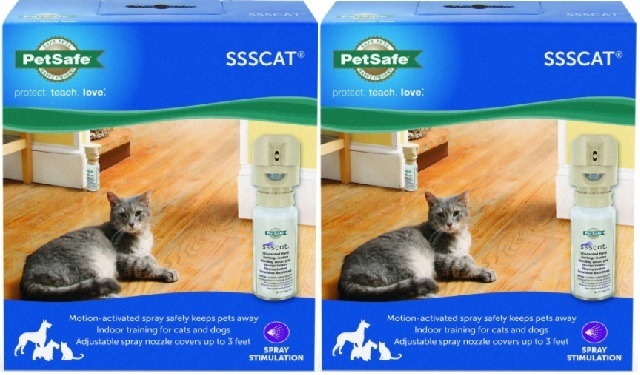 The cats tend to last for about 80-100 sprays or so according to PetSafe though. Are there built in delays between sprays? Yes, the default delay is two minutes between the first spray and the next to keep it from spending the whole canister in a few minutes time. Absolutely, but it isn’t designed to be weather proof. Also keep in mind that almost any motion will set it off so you could quickly go through your supply of canned air using this option. It will work in the dark, but it doesn’t seem like it is able to detect things as far away as when it is well lit. Where can I get additional canisters of air? You can refill the original can with a bicycle pump and a tire valve, check this video out for details. They can be purchased right here if you need them. These are the branded versions. Rumors indicate you can use any can of compressed air like these after you remove the top, but I haven’t tried it yet. While the SSSCat Automated Cat Deterrent has a lot of merits and I’ve had positive experiences with it for my two resident cats, I’ll freely admit that the product isn’t going to work for everyone. My two resident cats are pretty skittish and are scared off by loud noises and sudden movements. I’ve also seen success with a foster cat that was the biggest counter surfer I’ve ever met! 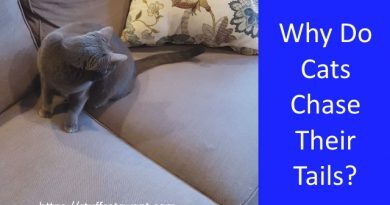 If you’ve got one of those cats that just doesn’t seem to care too much about what goes on around or just isn’t really afraid of things like loud noises or sudden movement then this may not be very successful in deterring your cat. If you have any other thoughts on the SSSCat product or any experiences of your own to share then please do leave a comment below or shoot me an email at Craig@StuffCatsWant.com so I can update this post. Great review! I really appreciate that you chose to review a product that you have used on multiple cats that you’ve fostered. To me that provides a more accurate review, because like you said, all cats are different. Also, nice tip on refilling the can. When looking at a review it’s always great to get tips and tricks for a better user experience. When I try this out I will let you know how it goes! Glad you found it helpful, thanks for reading Kayla! Wow what a great idea! I’ve only heard of compressed air in cans like that for cleaning keyboards and other electronics. Never thought about using this sort of thing as a deterrent for animals! I love how every single one of your articles that I have read are full of non-harmful ideas for cat training. All practical things that I can do without feeling like a jerk or risking my relationship with my cat. It’s funny that you say you forget about this specific type of cat deterrent after you’ve set them up around your house, because I know I’d do the same thing. I can just imagine going into the kitchen to get some water in the middle of the night… dun dun dunnnn! I agree that the success of this product probably depends on the personality of the cat, but I think it’s definitely worth a shot! What drew me to this site was the title. The review was put together quite well. I’ve heard this might work for a small dog, what do you think? The product should work just the same for a smaller dog. I don’t think it would have much impact on a large dog like a lab or a golden retriever though. Something like a yorkie would probably be startled off by it. I can see how some cats it would work on and not others. But do you think it is possible that after a few encounters they will naturally stay away from the area? Sort of like housebreaking a dog? Some pets are trainable like that. With my two resident cats they certainly can get ‘afraid’ of an area for a period of time. Dogs in my experience tend to break a habit for longer periods of time, cats get curious and start exploring the area again. It might take a few weeks, or even a few months, but they’ll head back! This is one of the reasons SSSCat is so nice, it is super easy to setup as soon as you see the behavior appearing again. I don’t have a cat, but my daughter does. It is very sensitive to noise and movements, gets scared easily, and runs away to hide. My daughter is always looking around for a product to help calm her cat. I am so sorry that the SSSCat Automated Cat Deterrent won’t work for her, but I have a friend whose cat would do better with this product. I will share this article with her because I know she will be happy with this one. I have an antique chair that has been in my family for a while and usually we just spray my cat with water, but this looks like a good option to replace it. This can do the work for me! My cat, though, is pretty smart. She is quite knowledgeable, so I imagine she will learn her way around it and I will be forgetful to move it around. Do you have any advice for me in this regard? I want to protect my chair and stay on top of my cat. I look forward to hearing your answer. While the SSSCat is a good option for you in the respect that there’s no potential damage to the chair, it would indeed require you to remember to move it around. Note just like anything else, every cat is different and this may or may not work for your cat. That’s why yo see the average rating at about 3.5 stars. I had no idea that there was anything like this available to deter cats. What a wonderful invention! I can see how it could possibly be hit and miss, as you mentioned for fosters, with various personalities. Thank you for sharing the video that shows how we can refill the can, as it could get costly! I started using my SSSCat a lot more once I realized you could refill the cans this way, it is just so much cheaper. Paying for the refills was really adding up!